Believe it or not, the holiday season is just around the corner. While most of us look forward to this time of year, it can also be a difficult season for many of us. For couples, in particular, it can be a time of contradictions. On the one hand, it is a time to connect, celebrate, and share our gratitude and love toward one another. On the other hand, however, the holiday season can generate a great deal of stress that can negatively impact a romantic relationship. There is an emotional, physical, and financial burden that comes for most of us during the holidays, all of which can translate into conflict and disconnection in a relationship. How do you prepare your relationship for the holidays so that you not only get through it in one piece, but so you thrive in it and really, truly enjoy it? 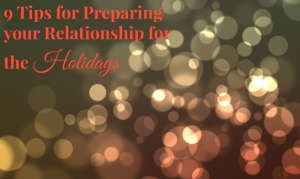 Below are 9 tips for preparing your relationship for the holidays. 1. Talk about what you each want to get out of the holidays. This time of year can mean many different things to people. For some, it is about spending time with family. For others, it is about dedicating time and energy to service organizations. Others resonate with the religious and spiritual facets of the holidays. Do you and your partner know what makes this time of year special? Or difficult? Be clear about your own needs for how to make the holiday season meaningful for you. Do your best to honor one another’s needs. 2. Discuss plans. Juggling two families during the holidays can be stressful, but you and your partner can make the best of this by sitting down to discuss your plans for where you will be when (and why!). Be specific, considerate, and flexible as much as you can. 3. Talk about your finances. Throwing parties, traveling, buying presents — it all adds up. Financial stressors abound this time of year, so be proactive with your partner by talking, specifically and clearly, about your expenses and budget. Make a plan and stick with it. 4. Know your limits. Set boundaries. This time of year is a time to practice saying “no.” You and your partner should discuss what your limits are in terms of finances, time spent away from home, and family of origin involvement. This is not harsh or unkind, but rather it is respectful of your relationship’s needs. Most likely, your friends, family, and colleagues will respect and understand your limits. Remember, you will probably not enjoy this time of year if you and your partner are overwhelmed, stressed, or angry. 5. Take time to be together (just the two of you). As a part of setting boundaries, be diligent about taking time to just be together as a couple. Even if it is during a social gathering, steal away together for a few minutes to talk or hold each other’s gaze from across the table. It is important that you and your partner make a conscious effort to stay connected if you have a busy holiday schedule. 6. Evaluate (and re-evaluate, if necessary) your expectations. It is easy to succumb to the pressure to have the holidays be “perfect,” but this creates unrealistic expectations that often generates negativity, disappointment, and conflict between partners. Are your expectations set too high? Be mindful about what you think your holiday season “should” be like. It might even be helpful to make a list of all your holiday expectations, evaluate them, and make adjustments to fit the unique qualities of your life and nobody else’s. 7. Pick your battles. As you think about your busy schedule and the competing demands that pile up this time of year, ask yourself what really matters to you. Do you really want to get into an argument with your partner about what gift to give your sister-in-law? If a family member engages you in an age-old conflict, do you want to take the bait? Take some time to really assess what is most important to you and let the rest go. Remind yourself that most of these little conflicts are just not worth spending time and energy on. 8. Relax! Perhaps now more than ever, you and your partner should think of ways to relax. What are your favorite self-soothing strategies? What can you plan to do to recharge your batteries? Take a bath, plan a massage, or order in something for dinner. Think ahead to when you suspect you’ll be most stressed and build relaxation time into your schedule. 9. Be mindful. When you are aware of the present moment, you will be better able to find genuine joy, appreciation, and satisfaction this time of year. Try to focus your attention on what is good and positive about your present situation, rather than anything negative that might be coming up. This will help you and your partner better manage the stressors that arise this time of year and actually enjoy the holiday season!